I have always tried to read books from different genres, having prior experience with finding my most favorite books from genres I thought were least possible to be from. Fantasy is one such genre. Some of my most favorite books have come from this, and some have made me wish I never picked them up. So when I got a chance to read 'The Perfect Tear', something told me it would be a well written book, with attention to detail and clearly of excellent lilting prose. The book's cover was one of the most stunning pictures I had seen in recent times. It was a fantastic and tasteful image that set the mood and tone of the story well. The summary was quick, short and though it did not offer anything great or thrilling, it was good enough to hold my attention. There are two reasons why fantasy novels work. (b) The author gets to have complete freedom with the way the world is designed. Five legged, thirteen eyed creatures can walk upside down with their telepathic abilities helping them move forward, and no one would really complain. The genre keeps the reader prepared to expect the unexpected. (a) The imaginary, creative world must NOT be beyond the reader's imagination and the more it veers away from what is considered normal, the more explanation it needs. (b) The author does not exercise the infinite power of writing the most unexpected of things, and instead assumes certain things they created are understood directly. It is therefore essential for a fantasy novel to be well written, hold the readers' interest, manage to create a new and exciting world and bring a story to an exciting finish, while holding some moral values and having a message (optional). The Perfect Tear meets most of the above criteria. There definitely is an interesting story, there is a great finish, the world is new and exciting, and the novel is well written with good language that feels so soothing to read. It is the tale of Eleanor, forced to live in an orphanage after being separated from her dad, who was supposed to teach her the ways when she was 16. Her songs have the power to keep the world from plunging into doom, and therefore she is expected to put aside her personal desires and strive for the betterment of the world she inhabits. 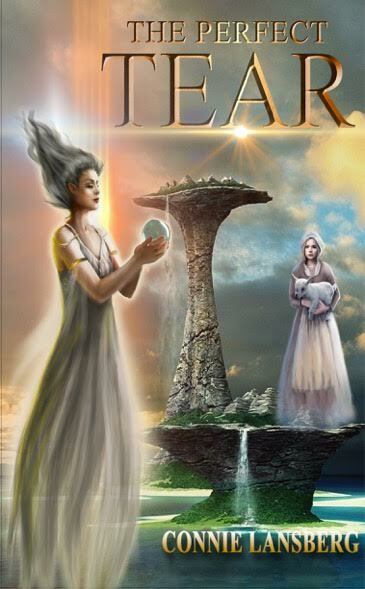 Devastated by few events in her life, she sets out on a quest, having found out her real life purpose - find The Perfect Tear and release its healing power on the world or stand by and watch as it is destructed by a powerful foe. Whether or not Eleanor succeeds and how she manages to do it, if so, forms the rest of the story. The main attractions in the book are the extremely well written chapters. Though it does shift between multiple points of view, it is easy for the reader to be completely engrossed, especially after the story of the 'main character' begins. The setting is gradual and evolving into perfection easily. The words are perfectly suited to the theme and genre, making it easier to read and thoroughly enjoy the story. The story falters in only two areas. The beginning is so abrupt, and kind of difficult to follow (but you do get used to it over time, as you get comfortable with the narrative). It is a bit hard to understand the talk about vibrations and frequencies and tones in the initial chapters. A little bit of description would have helped the story here. The second minor problem is that - it follows a path laid out by previous books of this genre. The story itself is lovingly unique, but it does tick off the main boxes for a book to be considered as fantasy as far as plot outlines go. I did expect some more twists for such a beautifully written novel. Overall, The Perfect Tear is not a book you are likey to forget easily. It seeps through the mind, brilliantly holding the attention with its well crafted words and clean narrative that did not falter despite the focus shifting back and forth between the various characters. It is a good tale of good Vs Evil, with enough twists to keep it interesting and written with the right amount of all emotions thrown in. Go for this one, you will learn of a fantastic new world, in a story that would give some ideas about life, desires and sacrifices. The songs at the end of the book. Helpful. The writing was really good, and kept me engrossed. Extra descriptions would have helped the story immensely in certain places, so they are easy to visualise. A well written fantasy novel that will linger in the mind long after reading. I had already read 'When Our Worlds Collide' by Aniesha and absolutely loved the book. Above and beyond the story, the writing style kept me glued to the book and I remember finishing it at a go. So naturally, I was very eager to read this book, too. In comparison, the summary of this book seemed sweeter (who doesn't like pure and simple high school romances?) and the cover (though a little less impressive than the previous) was a curious design of patterns. Basically, I just read the summary to know what the story was going to be about before I delved in, and it was more than enough to interest me. There is a comforting familiarity in reading the books of an author whose books you have read and loved. There is no preliminary decision-making stage, the 'do I read this now or later' dilemma. Once you are able to get your hands on the book and have some time to spare, you kind of delve in directly, knowing that the words on the page will seem like a personal, one on one conversation that the author has with you, narrating the story as you listen with rapt eyed attention, captivated by the words. That was the effect I had while reading When Our Worlds Collide, and I sat down to read this book too, with the same expectation. And it did not disappoint. The soothing effect of the words was back in this one too. The story premise is simple. There are two high school sweethearts, Diya Rai and Ashwin Choudhury. Diya breaks the 'relationship' up because she fears high school is a 'parting of ways' period and Ashwin might dump her when school ends. The 'break off' announcement is so abrupt, so sudden that Ashwin is startled. They part ways and two years later, Diya chances upon Ashwin in a bookstore, and ducks out of his field of vision, trying to slink away unnoticed. And then the reminiscence begins, with Diya being thankful that Ashwin had apparently not noticed her. But it so happens that Ashwin actually noticed her and knew she was trying to slink away (a cute execution of this scene deserves full credits). The story travels in two timelines, back and forth and is narrated from two points of view (that of Ashwin and Diya). Both of them have new people in their life, respectively, and Ashwin cannot help but be jealous of the new best friend, Nina, that Diya seems to have. Repeated meetings, both expected and sudden, make Diya and Ashwin clash with each other. Neither Rishab, Diya's current boyfriend, nor Trina, Ashwin's probable girl friend, like the way the high school sweethearts bicker with each other. And though their suspicions are actually baseless, the readers do get the reasons behind them. While one is reading the story, it would really help to remember that both Diya and Ashwin are barely 21, and the initial romance happened in high school, a period where drama and hormones rule. There is a bit of excess drama that would have looked out of place anywhere else, but in this story, it fleshes out the characters even more than what they actually are. The dialogues, assumptions etc are true to the nature of the story line and the age of the characters and the absolute complete belief that teenagers and young adults have about the temperamental nature of love. The book succeeds because Aniesha does not make the characters complex. IN this day and age where love and long standing relationships are complex and often looked at with disbelief and doubts, the inner turmoil of both the characters and the passion and ego they feel in equal measure have been brought out extremely well. There is something incredibly special about a high school romance - you never really forget the first love, and anything anyone ever does might remind you of that person you fell in love with madly, deeply - like the fresh morning footprints on a night of undisturbed snowfall. The quotes and writing style are the USP of this book. The reader can feel the words wrap around them in a comforting cocoon, making them laugh and groan at places. I personally loved the character of Nina very much (and her drunken rants even more), and feel that a little more backstory to Diya's mom would have made more of an impact on the reader after the big reveal. It would have helped the readers connect and empathise more with Diya and her truant attitude. Like the beautiful quote in one of the author's previous books, this one too, is about the journey, not the destination. The ending is both predictable and unpredictable in its own way. The writing is alluring and elicits the right reaction from the readers in many places (it does not break the concentration even with the typos and errors). The climax is only a leg of the journey and not the ultimate goal of it. 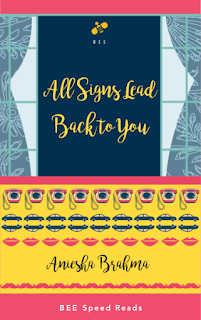 The emotions and complexity associated with modern day relationships have been written about so beautifully that this book will instantly connect with your hearts. This book will surely grab a place as a comfort read, sometimes taking the reader back to their own high school days. 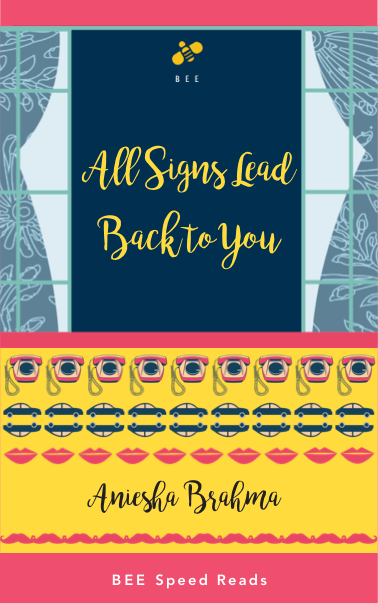 All Signs Lead Back To You is an ordinary story narrated in an extraordinary way. The smooth writing style. There is a charm to it. The ending left a bit to be desired - it was rushed. A comfort read, would find a place in my bookshelf. Waiting for the author's next! I picked this book up for two main reasons. It had been so long since I had read a YA fiction novel, and it had an alluring cover. Something about the cover and the font in it made me want to read this. There was simplicity in the colour combination but elegance in the font and title placement. I moved on to the summary, and despite one or two glaring phrasal errors, I managed to understand what the book was going to be about and began really eagerly. It is hard to pen a book set sometime in the bygone centuries / decades and still manage to maintain the accuracy of information presented regarding the time and social circumstances of that period. Harder still is to combine two different worlds with 'centuries' in between them, trying to mingle it with a dystopian fiction. The narrative succeeds for very few reasons, and one of them is the freshness of the writing and the uniquely named characters. It was a different experience to read and try and figure out where the mythology angle came in. Though I enjoyed the story and the book itself, it was not because it was based on one of my most favorite genres ever, but because there was a stoic beauty in the way the struggles were portrayed and that is where the author managed to connect with me as a reader. 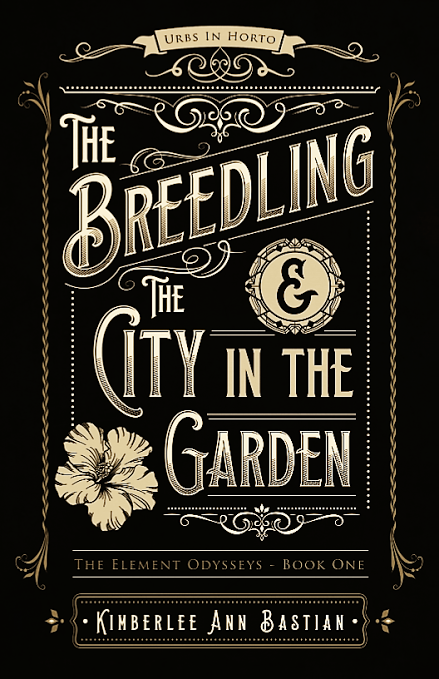 The Breedling & The City in the Garden managed to grab and hold my interest in the prologue and a few subsequent chapters. But with continued reading, even to someone like me who was not part of the original scene setting in any way, some things sounded really off key. Writing a book that combines two different worlds can confuse the reader if not executed properly. Most importantly, I could not shake off the feeling that the narrative mingled the scenes from different eras mentioned in the book and though this might not be a problem for many readers, it did make me pause occasionally. Constant reminders (using the characters like Bartholomew who travels in 1930's Chicago, to serve punishment for breaking rules) of this book being an YA Fiction is done with the different vocabulary (invented terms, if you will) showing that there is more to this book than just the visible America. Mingling mythology with a relatively modern realistic America was not done quite right. What concerned me the most about this (otherwise well written) book is that the summary and the story seem like they belong to different worlds altogether. I do have the habit of checking if a story adheres to the summary and what it promised on the back cover and this book was a bit off the mark from what I expected it would be. Classifying books into specific genres seriously limits the scope of the creator and the reader, but when a book goes in a circuitous route to say something, it might look like a journey that lacked destination. I will, of course, appreciate the book for the writing, but there are certain flaws that need to be corrected in the subsequent books in the series and I would recommend this book to anyone who is bored of the regular mythology books out there and want to try something different. The epilogue was one of the best parts of the book. The book needs to be a little more concise and accurate about the timeline it is supposed to be based in. I would recommend this book to anyone who is a mythology fan but is bored of the same old run of the mill stories. If you want to read a different book from your genre, go for this. Kimberlee Ann Bastian has a unique love affair with American nostalgia, mythology, and endless possibilities. This melting pot of elements is what prompted the creation of her epic ELEMENT ODYSSEYS series, starting with the reboot of her debut novel now titled THE BREEDLING AND THE CITY IN THE GARDEN. When she is not in her writer's room, working her current "day job", or consuming other literary worlds, she enjoys hiking and cycling around the bluffs of your Southeastern MN home and catching up on her favorite pop culture. How did you get started as an author? What was your first professional job as a writer? These are questions that authors are often asked by readers who are curious about what puts a seemingly normal person on the path to getting paid for writing about intrigue and mayhem. So, here is my story about what set me on my current path of writing about chaos, deception, and mayhem. Back when I was in high school, students aspiring to go on to college took college preparatory classes, while those planning to go straight into working at the General Motors plant that employed most of Lordstown, Ohio, population and then some, didn’t. Since I had no intention of spending my life chained to an assembly line, but rather traveling the world writing murder mysteries like Agatha Christie, I took the college prep classes. I found one problem with this path. While I was studying how to format footnotes, those students training to work for General Motors were learning creative writing. For a future novelist, this seemed vastly unfair. My friend Suzanne was the class mouse. Resembling Velma in Scooby Doo, she wore turtle neck sweaters that covered up all her flesh for fear of someone actually seeing her. Donning big coke bottle glasses, she would hide behind me in class and chastise me for raising my hand to answer questions because when people turned to look at me, they might actually see her cowering behind me. So, you can imagine her state when she was informed that the term project for her creative writing class was to write a short story and read it out loud in front of the class. Just in case you can’t imagine: Suzanne fainted. For weeks, my best friend fretted and whined while I drooled with envy. They got to use their imaginations while I was memorizing the names of all the parts that make up a bibliography. “Nothing interesting ever happens to me,” Suzanne would reply. She was right there. The girl went to school and then home to watch reruns of The Brady Bunch. She wasn’t allowed to watch The Partridge Family, which her mother considered too racy. She didn’t go to school games, date, or leave her yard. This teenage girl had never even been to a pajama party or kissed a boy. Having never experienced anything, she had no material for a story. 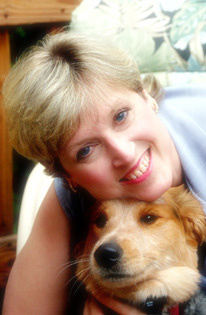 “How can I write a whole story about my dog’s fleas?” she asked. My writer’s imagination took off. By D-Day, Suzanne had nothing except hives. “It’s due after lunch,” End-Times-Suzanne whimpered. With a deadline of one study hall and lunch period, I wrote her story. Suzanne paid for the project with a cheeseburger, fries, and diet Coke. Time was so short that she didn’t even have time to read it before the teacher ordered her to the front of the room to read it out loud. My classmates talked about it for days. They declared it hilarious and clever. Stating that it was unique, imaginative and well written, Suzanne’s teacher gave my story an “A”—the only “A” she got for the whole class. Over three decades later, I am now the author of eighteen murder mysteries … and Suzanne is still not speaking to me. I thank the author, Lauren Carr for this beautiful story about her first experience with writing. Much like her books, the story had me completely engrossed and left me with a smile. Thank you, Ms. Carr! Please do keep writing more. It is always a thrill to read a book from a different series by the same author. When you are used to a certain writing style, it is a different experience to read about a completely different set of characters. I have read a few books by Ms. Carr, from her Mac Faraday series and her Thorny Rose series. So though it was a book about characters I was not used to, I was looking forward to reading the book mainly because I loved the way the author usually crafts her mysteries. I expected the book to be a page turner, and was sure it was not going to disappoint me. The cover is right on point. Simple but clear in its design, conveying what it wanted to say in a very aesthetically appealing manner. The summary began with a super line and introduced the characters who are central to the plot. 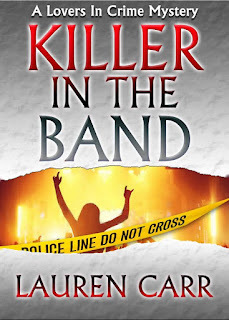 Killer in the Band is a book from the Lovers in Crime series and my first from it. The book begins with J.J. returning to his family home, having graduated from law school. He quickly leaves the family home (the story talks about the difference between him, his father and step mother) to be with Suellen Russell, a woman twice as older as him. Though this is a cause for shock and concern for his parents, the problems only keep multiplying. Suellen herself is harboring a secret. 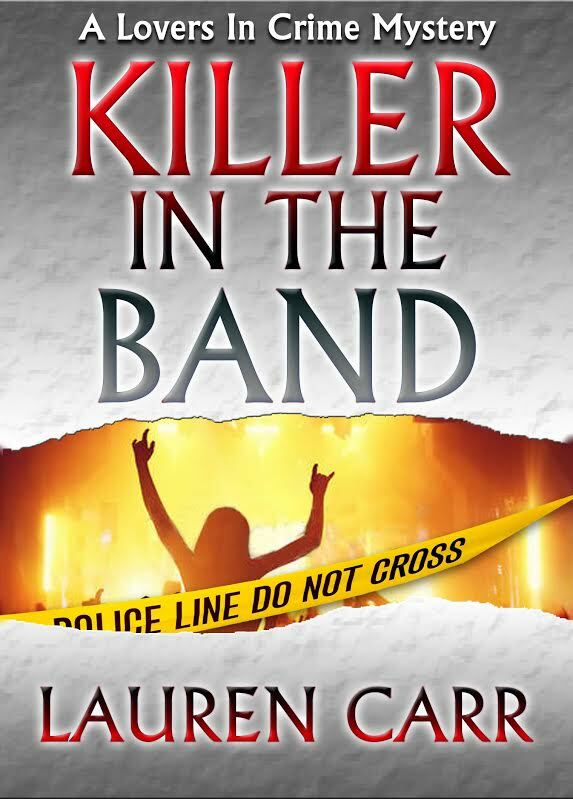 A member of her band disappeared and was found dead and she knows something about the fateful night. What terrorises the Thorntons more than anything is the presence of a new killer, and their fear that JJ might somehow be caught up in the confusion. Because when it comes to issues of life, other personal differences need to be set aside. The story gets into the fast mode soon after the opening pages, with a brilliant prologue to match. (Really loved the 'fan' line there). Things are not as calm as they seem in The Russell Ridge farm house. Cameron Gates (J.J.'s stepmom, Joshua Thornton's wife) starts investigating one murder, a cold case of Dylan, the band member who disappeared and turned up as a corpse and it quickly includes successive murders that keep the reader on the edge of their seat, playing a constant guessing game as to what might happen next, trying to connect the dots to make sense of the connection between and the motive behind the murders. This books needs a special mention about the complexity of the characters involved. Unless you are quick with remembering names and wondering why story developed along what lines, it is hard for you to follow the different stories and understand them when they merge together seamlessly. The book requires more concentration than normal to understand and follow the story. In addition to the different characters there are also a considerable number of twists that might alter the reader's perspectives many times over the course of reading. This is a huge, challenging plus in my case, and I love the book all the more for this. Overall, a brilliantly woven mystery thriller, with a clearly surprising climax. The book never slackens in pace. This earns it special points from me. If you are used to one set of characters by the author, this will seem completely different yet very similar in certain cases. Some parallel story lines cannot be followed if you are not paying attention to each seemingly simple detail. A perfect treat for fans of the author, and a good murder mystery to keep fans of the genre engrossed.